2016 has already been a busy year for Recipero resulting in our connected device fraud and theft intelligence solutions producing some very interesting statistics. A more detailed report will be published at the end of Q1, for now though here are some significant facts you might find interesting. A print optimized version of these stats is available here. In the first two months of 2016, Recipero provided intelligence on transactions involving over 10 million devices globally. 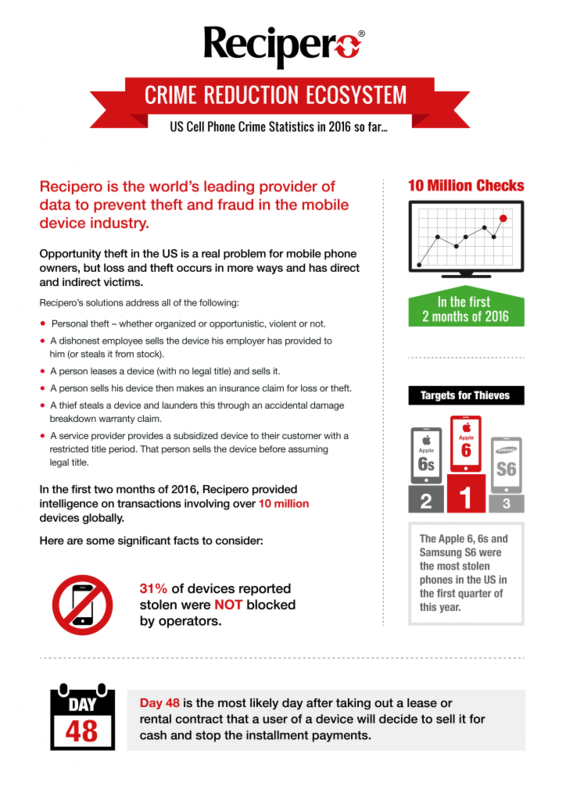 31% of devices reported stolen were NOT blocked by operators. The Apple 6, 6s and Samsung S6 were the most stolen phones in the US in the first quarter of this year. Day 48 is the most likely day after taking out a lease or rental contract that a user of a device will decide to sell it for cash and stop the installment payments. 7% of devices that are blocked when an insurance claim is made for loss or theft are unblocked within 30 days. 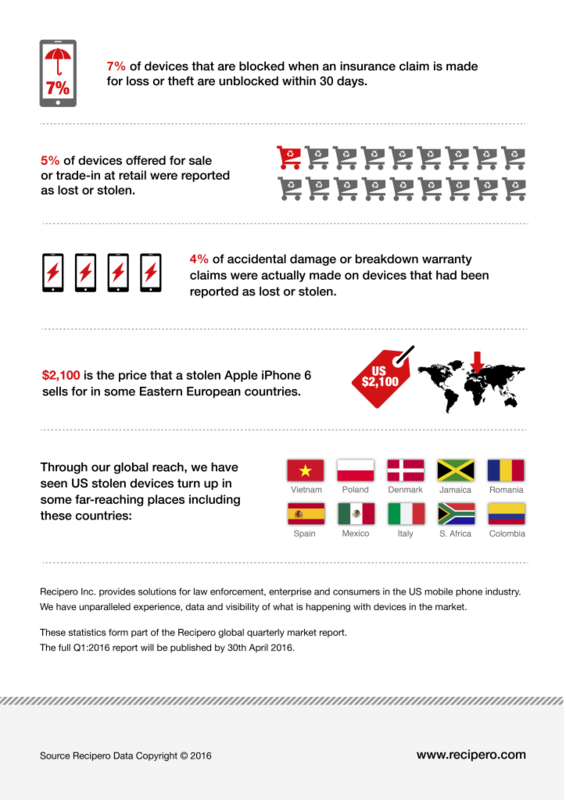 5% of devices offered for sale or trade-in at retail were reported as lost or stolen. 4% of accidental damage or breakdown warranty claims were actually made on devices that had been reported as lost or stolen. $2,100 is the price that a stolen Apple iPhone 6 sells for in some Eastern European countries. Through our global reach, we have seen US stolen devices turn up in some far-reaching places including; Vietnam, Poland, Denmark, Jamaica, Romania, Spain, Mexico, Italy, South Africa and Colombia. To keep up to date with future news and releases like this please sign up to our newsletter. 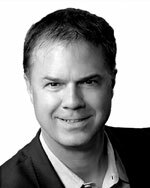 Recipero is delighted to announce the appointment of David Dillard as Managing Director – Americas. David joins Recipero with a reputation for extending mobile technologies across multiple platforms with revolutionary revenue models that cover banking, media, entertainment, real estate, and retail. Over the past 20 years he has held senior positions at Verizon Wireless, Uni-Mobile, Advertising.com, Point.com, and Sprint PCS. This experience will assist Recipero’s continued development across enterprise, Government and consumer channels. Recipero, the connected-device industry’s trusted 3rd party, are device-led data experts delivering critical and timely intelligence to the wireless industry, insurance companies, law enforcement and retailers and recyclers. Solutions focus on with fraud prevention, transaction verification, device due-diligence, crime investigation and device ownership registration. Providing a “clear title” for buyers and sellers of connected-devices, Recipero solutions work to ensure a smooth carrier re-activation experience. Consumers and enterprises have lost confidence in buying or selling a used cell phone due to the growing issue of a device being blacklisted when it has been lost or stolen or has an outstanding contract/lease against it. Recipero provide connected-device history reports that reveals if a phone, tablet or other mobile device has been lost, stolen or is associated with an unsatisfied lease or contract. Recipero has aggregated over over a billion data records over the past 15 years which drives over 5 million inquires per month from law enforcement, consumers and enterprise. Users include Sprint, Vodafone, T-Mobile, Brightstar, Assurant, GameStop, Gazelle and Ingram Micro. The National Pawnbrokers Association (NPA) took another step forward in the fight against crime when it agreed to work closely with Recipero to benefit from and contribute to the Recipero Crime Reduction Ecosystem. The NPA have entered into a Memorandum of Understanding with Recipero, to help facilitate provision of our CheckMEND history reporting service – enabling pawnbrokers across the UK to check that items being offered to them have not been reported lost or stolen. “This is yet another step by pawnbrokers to help the police to crack down on crime”. “We endorse the ‘Gold Standard’ whereby pawnbrokers check for ID and use UV lights to check for forensic property marking”. “In London, we endorse the ‘Safe Seller’ scheme where pawnbrokers keep clear records so that criminals are kept away from stores. In Scotland, we are working with the police via regular meetings of our Forum to crack down on crime. Across England and Wales, we are working with the Home Office on measures to stamp out crime”. “Now – with our agreement with Recipero – NPA members can use CheckMEND to check whether any items that enter their stores have been reported as stolen”. “All this and more demonstrates clearly that 21st century pawnbroking has a zero tolerance approach towards crime”.